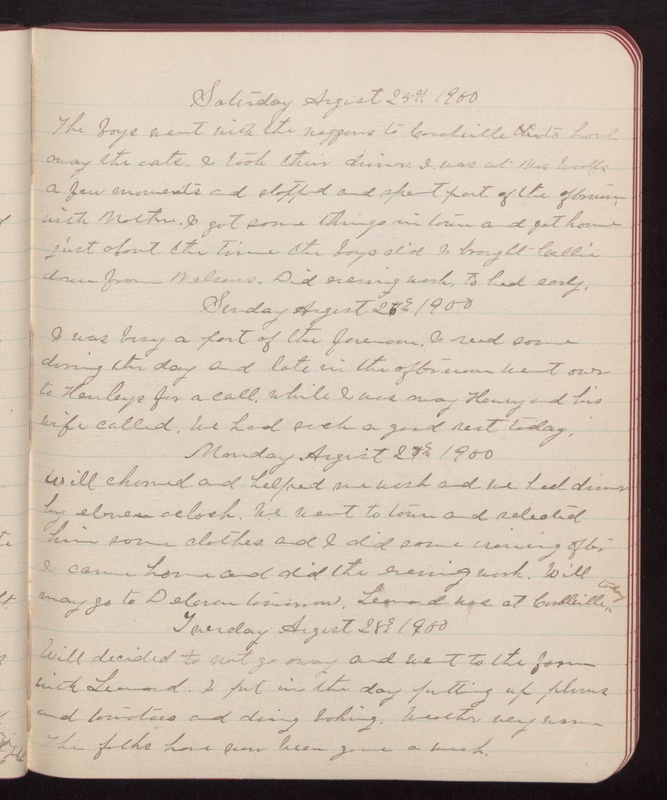 Saturday August 25th 1900 The boys went with the waggons to Coralville to haul away the oats. I took their dinner. I was at Mrs Woolfs a few moments and stopped and spent part of the afternoon with Mother. I got some things in town and got home just about the time the boys did I brought Callie down from Nelsons. Did evening work. To bed early. Sunday August 26th 1900 I was busy a part of the forenoon. I read some during the day and late in the afternoon went over to Henleys for a call. While I was away Henry and his wife called. We had such a good rest today. Monday August 27th 1900 Will churned and helped me wash and we had dinner by eleven oclock. We went to town and selected him some clothes and I did some ironing after I came home and did the evening work. Will may go to Delavan tomorrow. Leonard was at Coralville today. Tuesday August 28th 1900 Will decided to not go away and went to the farm with Leonard. I put in the day putting up plums and tomatoes and doing baking. Weather very warm The folks have now been gone a week.